STROM is an incredibly fun sampler. Record up to 10 seconds of audio, slice and sequence it, resample, create something entirely new! Elsa is a retro style sampling keyboard with tempo based looping. Record, save, load, reverse samples with a multi octave on screen keyboard or plug in your core midi device of choice, soft- or hardware. Elsa comes with three built in effects, a reverb, a resonant low pass filter and a frequency/bit crush. Samples are looped in three different modes, one off, forward and/or forward-reverse. The start and end of playback also comes in three modes, one set of start and stop for all, one set per note and/or one set per octave, allowing for many different types of samples. Additionally at playback time, sample length can also be controlled by a set of sample dividers, 1-8. “ME MIDI Sampler” turns your device into a sampler for professional audio special effects. 1) record the audio special effects (using the record button of “ME MIDI Sampler”) or create it using any wave editor for Mac or PC (such as Audacity). 3 ) import audio samples using the “IMPORT” button and assign them to the 84-key MIDI keyboard by pressing the “WAVEFORM” button of each key on the MIDI keyboard (You can assign a different audio sample for every key on the MIDI keyboard). At this point you can play live your special effects (polyphonic keyboard up to a maximum of 84 voices, 84 special effects for each BANK). You can adjust the sample start time, volume, pitch bender, sustain pedal, etc… for each audio sample that You have assigned to the keys of your MIDI keyboard. The configuration of the multiple special effects created and assigned to the MIDI keyboard can be saved in a new BANK, in the archive of the BANKS of “ME MIDI Sampler” (infinite BANKS can be saved in the database, until the end of the physical memory of the device). The BANKS previously saved can be loaded and used in real time during live performances. Sample your voice, musical instruments, and ambient sound. Create a multi-timbral synth by combining samples from different instruments. Auto Sampler combines pitch detection, sound sampling, and wavetable synthesis into easy to use app that runs on any iOS device with a microphone. Samples are automatically extracted from live audio through the microphone input (built-in or external). The pitch detector assigns a pitch to each sampled sound, which is displayed on a piano keyboard as it is captured. A polyphonic multi-timbral wavetable synthesizer resamples and blends samples into a continuous palette of sound. The synth can be played with the built-in keyboard, from other apps, or remotely using standard MIDI controllers. Controls adjust blending, modulation, attack/decay, and other parameters. A small string/woodwind orchestra constructed from the University of Iowa’s musical sample library is provided to get you started. 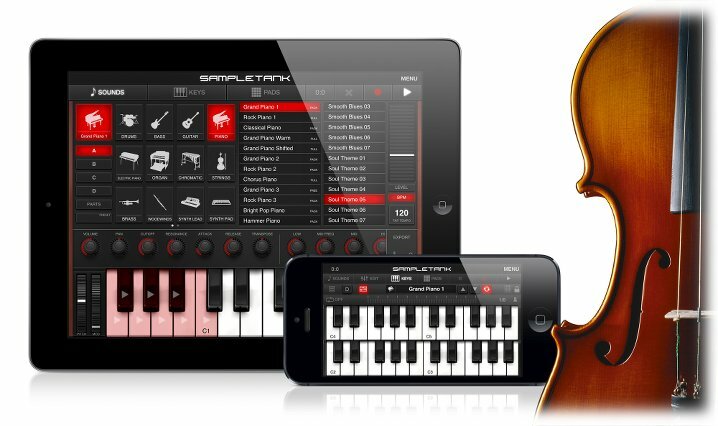 IK Multimedia, the leader in mobile music-creation apps and accessories for iOS devices is pleased to announce a new version of SampleTank, the premium virtual instrument and sound module for iPhone, iPod touch and iPad. The new version gives mobile musicians access to the world-class orchestral and choir sounds of Miroslav Philharmonik – Mobile Edition, plus adds sound-library management, so musicians can easily add, delete and re-download complete collections of instrument categories, as needed. The Miroslav Philharmonik – Mobile Edition for the SampleTank mobile app is available as an in-app purchase, and is derived from the insanely popular Miroslav Philharmonik standalone app and DAW plug-in for Mac/PC that’s used in studios around the world. These famous orchestral instrument sounds and textures have been heard in hundreds of Hollywood movie scores, and in compositions from some of the top performing pros like Serj Tankian (System of a Down), J.U.S.T.I.C.E. League, Sean Kingston and Lana Del Rey, to name a few. Miroslav Philharmonik features instruments that were beautifully recorded at the Dvorák Symphony Hall in Prague by Miroslav Vitous with the Czech Philharmonic Orchestra. These sounds have a texture, warmth, and beauty that is considered “the standard”, and is unrivalled in the virtual instrument world. The Miroslav Philharmonik – Mobile Edition for SampleTank includes 100 orchestral sounds and textures with multiple instrument performance styles, including 5 orchestral ensembles, 39 string instrument sounds (violin, viola, contrabass, cello and harp), 15 brass instrument sounds (trumpet, trombone, French horn and tuba), 12 woodwind instrument sounds (flute, bass flute, piccolo, clarinet, bass clarinet, oboe and bassoon), 4 vocal choir ensembles, 1 cathedral organ sound, 1 celesta sound set, 10 orchestral synth pads, and 13 orchestral percussion sounds. The version 1.6 update of SampleTank for iPhone, iPad and iPod touch also gives musicians a sound-management feature that provides the ability to add or delete sound-library collections with a single click, thus freeing up space as needed on their device for recordings. If a user deletes a purchased library and later wishes to reinstall it, it can be easily accomplished via the in-app restore feature. The version 1.6 update of SampleTank also adds stunningly clear iPad Retina Display graphic support the newer iPad models. The Miroslav Philharmonik Mobile Edition – along with future downloadable sound collections – requires iOS 6 or later, although the app itself will still work fine with iOS 5. SampleTank for iPhone, iPad and iPod touch is a complete professional-quality virtual instrument and sound workstation that allows musicians to use a portable keyboard/MIDI controller like iRig KEYS, or any MIDI keyboard controller with a MIDI interface like iRig MIDI, to create and perform with studio-quality instruments and sounds on the go. SampleTank is also Audiobus compatible, so it can be used with other mobile recording and DAW applications like GarageBand, AmpliTube and VocaLive for creating music on the go, anytime and everywhere. SampleTank is compatible with iPhone 3GS or later, iPod touch 4G or later, and any iPad model. SampleTank 1.6 for iPhone, iPad and iPod touch is available now as a free update on the App Store. The Miroslav Philharmonik Collection is available as an in-app purchase for $19.99/€17.99. Additional instrument collections will also be available soon via in-app purchase. If you’ve got a burning desire to load or record your own samples on an MPC style interface, this could be just what you’re looking for….